Planning for a trip? Need to book urgent bus tickets? Don’t worry, Mobikwik Bus Booking Offers will help you out booking your bus tickets conveniently in less than a minute along with awesome cashback & exclusive offers. So save yourself from the hassle of standing in long queues just for booking bus tickets & book your tickets now through Mobikwik. No more waiting in long queues, non-availability of the bus seats during holidays and random bus schedules. Now you can enjoy an amazing bus ticket booking experience : from selecting your seat number to bus type, from selecting operators to AC, Non AC, Sleeper, Volvo, etc. and that too at lowest possible prices. Below we have mentioned the latest working Mobikwik Bus Booking Offers & Coupons for you, so that you can save money on your bus tickets booking. 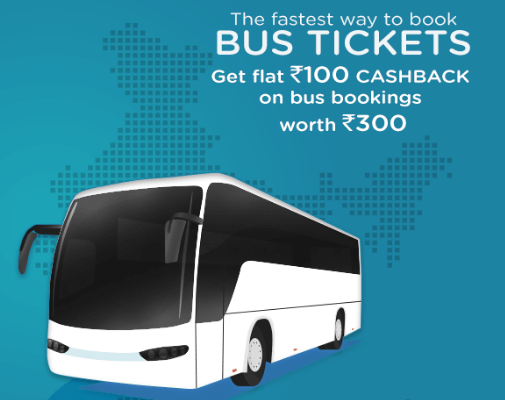 Keep visiting this thread to get more offers on bus ticket bookings. Minimum booking amount of Rs 300. Maximum Cashback of Rs 100. Applicable for all Mobikwik users. Applicable only for those Mobikwik users who are booking bus tickets for the 1st time. 2. Enter the details of your journey like destination, date and then click on Search Buses. 3. You will be shown a list of available buses. Select a bus according to your wish and click on “Pick Seats“. 4. Now select your Boarding & Drop points and the seat numbers. After you’re done, click on “Enter Passenger details“. 5. Login or Sign up for your Mobikwik account. 6. Now enter the passenger’s details like name, age, gender and contact details. Click on “Review & Pay“. 7. Finally review your booking and then make the payment using your Mobikwik wallet.